We first looked at the CUBE Aerium way back in 2016 when it was being launched as a prototype underneath Andreas Raelert. And at that time we said it was the “most sinister looking of all” the bikes that would be found on the Queen K that year. And since then three things have happened. First it still retains the title as one of the most sinister frames out there. Second we haven’t heard much from CUBE since then. And third, CUBE has gone and introduced a whole range of Aerium models under our noses culminating in the C:68 SLT we get to share today. The C:68 is a tri only machine – ditching UCI regulations in order to cut seconds from your T1-T2 split. 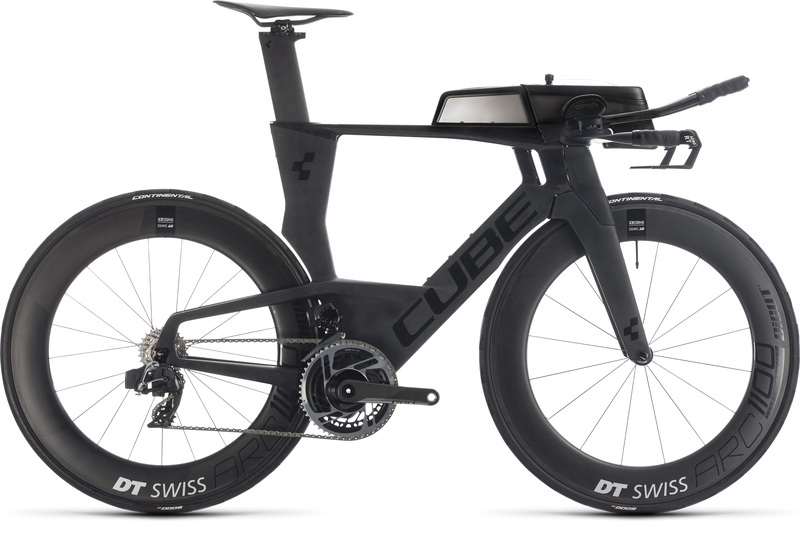 In developing this bike CUBE partnered with the aerodynamics team at Swiss Side to design a bike eengineered to be the most capable and aerodynamic bike of all time. With over 50 years of Formula 1 experience, Swiss Side’s engineering team is number one in aerodynamics, bringing the latest technologies to cycling research and development. The Aerium supports three hydration options (front, rear and downtube) including a new and improved front hydration system that offers added volume (750 ml), a sealable refill opening and the redesigned magnetic mounting system for stress-free fuelling. To get you that proper fit the Aerium is offered with four sizes to choose from, ranging from XS to L. Plenty of additional adjustment features let everyone find the perfect set-up, while high and low base bar options are available to suit different riding positions. The low version is 400 mm wide and optimised for maximum aerodynamic efficiency. The high version is 420 mm wide and 40 mm high, making reductions in aerodynamic drag possible that would otherwise require spacers. 17 height settings (from 0 to 80 mm using 5 mm spacers) and 28 possible pad positions culminate in a total of 476 different pad set-ups. The bike is also compatible with all wheels up to and including a rim width of 27 mm, all standard crank-based and non-crank based power meters, and both round and oval chainrings up to 55T. The C:68 SLT is specced with the brand-new 12-speed SRAM RED eTap AXS. The wheels are the 80 mm deep-section ARC 1100 Dicut wheels from DT Swiss (no surprise there as Swiss Side helped with the wheels development). Every time we see the Aerium we think how much we need to do a long term review of one. It is a wicked looking machine that looks like a blast to ride. We also want to dive deep in the handling of the Aerium as well as the hydration and storage options plus see how it handles in some fun cross winds. We hope it will be a lot sooner than 3 more years for us to hear about CUBE on our pages and this time we are looking for a full review rather than a first look. Cross your fingers!